Some Goblins choose a different solution to their cowardice: the get so hopped up on mushrooms that they foam at the mouth and rush their foes in a berserker frenzy, dying even while kicking and screeching at their foes. 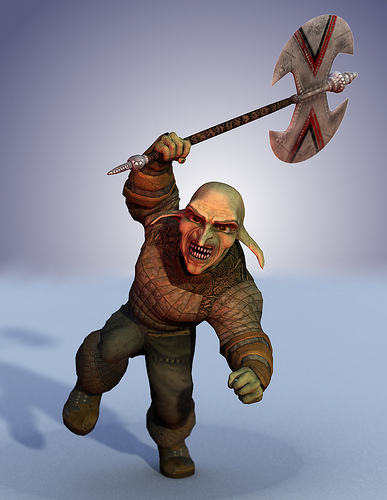 The sight of a short goblin wielding a club nearly as big as itself strikes many delvers as so humorous that they the actual lethality of their blows takes them by surprise. Sharp Teeth (14): 1d cutting. Reach C.
Big Club (12): 1d+6 crushing, unready after attacking. -1 to skill due to lack of strength. Reach 1, 2*. Traits: Appearance (Ugly); Berserker; Cowardice (12; -2 Fright Checks, mitigator: mushrooms); Infravision; Rapid Healing; Resistant to Metabolic Hazards (+3); Social Stigma (Savage). Combat Effectiveness Rating: 19 (OR 12 and PR 7). Notes: Goblin Berserkers rush their foes, giving no thought to defense, and always All-Out Attack, usually Strong or Determined, rather than Double (as they wield unbalanced weapons). Incapable of negotiation while drugged. If the players manage to end or outlast the berserk rage, the goblins are again subject to cowardice and generally just scream and run away.